Denis Glennon is the creator and owner of Iconic Images International. Western Australia is now his home. Prior to establishing Iconic Images International he spent over 35 years in the corporate world, in various parts of the globe. He holds graduate degrees in engineering and psychology and post-graduate degrees in science and education. In 2000 he was awarded his AO (Officer of the Order of Australia) for his significant contribution, over two decades, to environmental conservation and pollution prevention in Australia. A seven year spell in Zambia ignited a passion for Africas wildlife, landscapes and cultures. 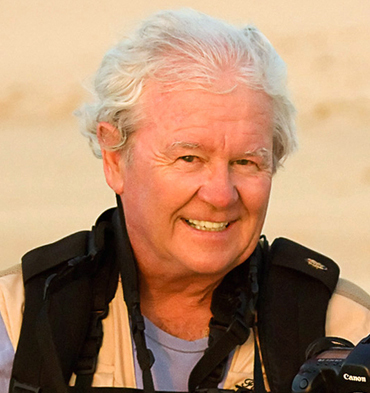 His greatest pleasure is introducing others to the magic of Africa, through the lens of a camera, especially with Art Wolfe. Photographing in Africa is unpredictable. His message to newcomers on Iconic Images photo safaris is: “Find your own rhythm and come to know Africas beat, because how you show curiosity and patience, kindness and respect, to Africas wildlife and people, needs to be authentic”. On safari, above all, he says to clients: “Look for that special moment. The iconic image of Africas animals or people will contain a unique, fleeting moment that reveals the very soul of Africa you are photographing”. The Iconic Images team he has formed is very special. All are passionate and respected professional photographers. It is a sheer pleasure travelling and working with them.